As we enter 2012, True Sport is proud to have surpassed 2,500 members who represent millions of Canadians from coast to coast. With the New Year still fresh, we realize that some resolutions can be difficult to keep, but why not consider giving back to your community by resolving to become a True Sport Champion? The great thing about the Champions program is that anyone can join. It doesn’t matter if you’re young or old, an all-star athlete or someone who’s never laced up a pair of cleats. As long as you have a desire to make a difference in your community— you are qualified. Champions are free to decide the best way to share the True Sport message in their community – after all, who knows their community better? No idea is too big or too small. The most important quality of a Champion is simply having a passion for improving the lives of the people around them. 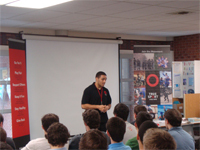 An elite athlete might include True Sport messaging in a speaking engagement at a school. A parent might make a presentation to their child’s school or school board, write a letter to their city council or encourage all the soccer teams in their community to join True Sport nt. A coach might bring True Sport to life in his/her team and sport organization using various True Sport resources. It’s up to you! As True Sport has evolved, we’ve learned that the most prominent change and the most exciting things happen when it’s actually the individuals in their own communities who take the lead in promoting values-based sport. People who really care about where they live have become some of the strongest advocates for True Sport. Sport has the power to make a positive impact in your community. The greatest benefits can be seen when it is fair, inclusive, fun and supports the pursuit of personal excellence. The values, principles and lessons that a child learns on the court, field or rink will help to shape them into the adults they will become. True Sport would like to thank all of its Champions for the work they do. A series of regional workshops will be held in the coming months to reconnect existing Champions and to provide training for new ones. These workshops will be a great opportunity for Champions to come together to share their stories, discuss strategies they have used for community engagement, and brainstorm plans for the future. Workshop dates and locations will be available soon. To learn more about how you can become a True Sport Champion or for more information about the program, please visit truesportpur.ca/be-champion.